Fun critical thinking activities -For students in any subject. 20 Quick & Fun Creative and Critical Thinking Activities - Here are 20 fun activities you can use whenever you have a few minutes. These would make terrific writing prompts. They could also spark some interesting discussions. 10 Team-Building Games That Promote Critical Thinking - Students must be engaged and cooperation must be practiced, and often. The following team-building games can promote cooperation and communication, help establish a positive classroom environment and — most importantly — provide a fun, much-needed reprieve from routine. 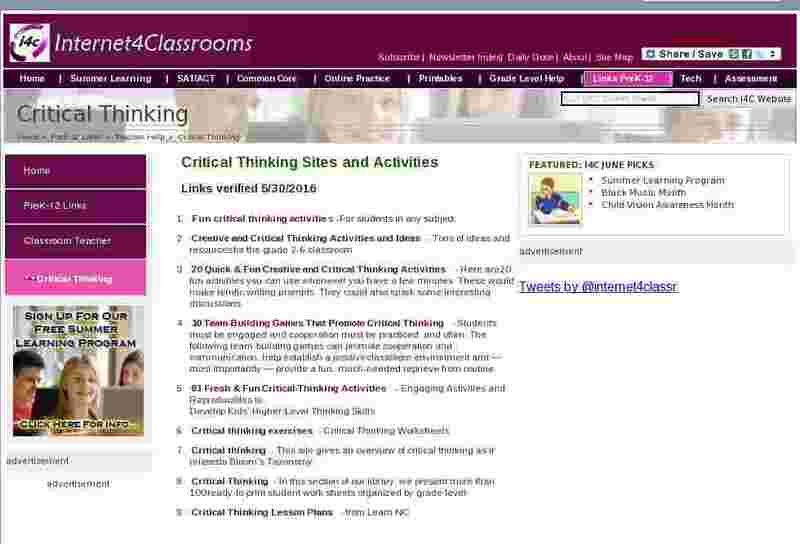 Critical thinking - This site gives an overview of critical thinking as it relates to Bloom's Taxonomy. Critical Thinking - In this section of our library, we present more than 100 ready-to-print student work sheets organized by grade level.